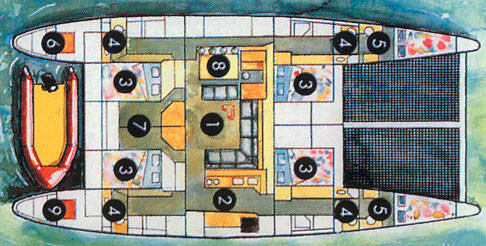 Quest is a 57′ Simonis classic catamaran. She’s a smooth sailing yacht, a spacious live aboard, and an adventure waiting to happen. She’s both the journey & the destination. Quest features four double en-suite guest cabins. A/C is available throughout for guest’s comfort. After many years of offering charters for up to 8 passengers, Quest is now a 6 guest yacht. This creates a more comfortable, attentive and specialized experience for all aboard. It also allows the crew to occupy a full stateroom while leaving extra crew quarters for add-ons like a private masseuse or dive instructor. The yacht has both indoor and outdoor dining seating, large nets in the forward bow for lounging about and enjoying the sea spray. The stern provides a fully equipped dive deck / swim platform, also great space for yoga or sunbathing. Uses eco-friendly cleaning products and purchases local and organic produce when available. Participates in reef clean-ups. Does not use plastic, straws, or disposable cups and plates. Sea-safe soaps, toiletries. Contact us for rates and current availability or to book a charter aboard Quest! Scuba Info Nikki is a DiveMaster. Light Italian style pinwheel sandwiches or hearty baked cheesy meat Stromboli. Wild Salmon or fresh Mahi Mahi poached over coconut milk & lemon grass risotto and local green beans. Tender Asian marinated flank steak over spicy garlic Chinese noodles with smashed cucumbers in spicy-sesame dressing. Pan roasted Chicken Provençal with garlic, lemons, shallots, and herbs province, served with crusty grilled bread. This trip has been absolutely amazing. Chris and Nikki are phenomenal! Everything was done to perfection. Can't say enough good things about our experience. Chris and Nikki were amazing! We truly enjoyed our time spent with them. Their (Chris, Nikki & Lulu) presence and attention to detail made the trip perfect. Quest was comfortable and well maintained. We really enjoyed the trampolines and the U-shaped couch in the aft. Many naps were enjoyed on both. Nikki's food creations were beyond our expectations. We were never hungry. Her love for cooking was evident in her dish presentations and the deliciousness of the food. The itinerary was perfect! We had ample time in each location. Chris was always willing to take us to shore to explore the local culture. This was the best vacation we have ever had.